The Complete Guide to General Reading is an useful book for any IELTS learners who want to sit the IELTS general training module and long for achieve 7.0+ for the General IELTS Reading Module. Reading is an essential skill to learn if you want to say you are fluent in a language. Without this ability you would miss out on the chance to obtain information from a wide range of different types of material like, newspapers, magazines, journals, books, leaflets and brochures. Certainly, you would never be allowed to enter a university to study if you were unable to read academic literature. As a student entering either an undergraduate or postgraduate course, you are expected to have reached a reasonably high level of ability in all four skills — reading, writing, listening and speaking. How high these levels need to be varies from student to student (partly because of the subject they have chosen to study) and from university to university. It might be possible, for example, to start a postgraduate course at university with an overall IELTS grade of 5.0 on the condition that a presessional course is taken first at the university. university to study their chosen course. The Complete Guide to General Reading takes you step by step, from a basic understanding of the IELTS exam, to a point where you have the necessary skills and confidence to take the exam. It is the intention of this book to provide you with everything you need to know to achieve a high grade in reading. It has also been specifically designed to make your journey enjoyable and less frustrating. Many of the sample exercises in Unit Four of this book are more difficult than you will face in the real test. However, they will teach you the skills that you need to get a good grade in the actual test. 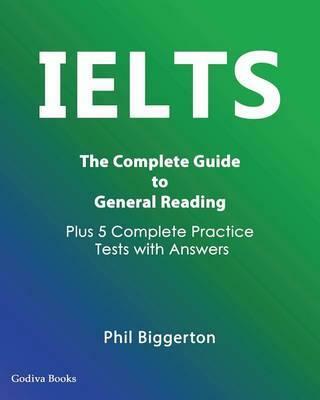 The five practice tests at the back of the book are very similar to the actual General IELTS exam. both fiction and non-fiction books for other authors as well as his own IELTS textbooks. He recently published the co-authored series Shortcut to IELTS with John Ross and Gary O’Connor. Please send me some practice tests for General Training. Approval of this request would be highly appreciable.